Before leaving Los Angeles, Sony and I decided to have lunch at a little spot in downtown LA's fashion district called Cole's that is famous for it's French Dip sandwich which originated in 1908. The restaurant is very charming, comfortable and cozy. It reminds me somewhat of John's Grill in San Francisco for it's ambiance and flavor. 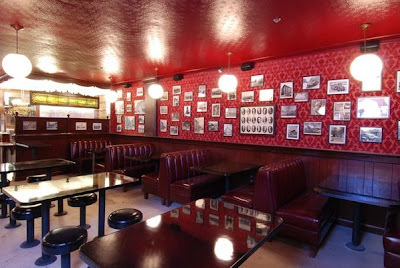 It is located within a historical landmark building and also houses a speakeasy in the back room. We wanted to get a glimpse of the room while there but they were so busy that afternoon that we just did not get a chance to see it. The waitstaff was friendly and got our food to us very quickly. Because I was going to be flying back home to San Francisco shortly after our lunch I did not want to have a big meal. I don't like flying whether it be 45 minutes or 14 hours and I never like flying on a full stomach. So, we decided to split our order. We had the Beef french dip sandwich, a side of bacon potato salad and a basket of garlic fries. The sandwich was very tasty on a crisp bun with the au jus on the side which I liked. So many other restaurants deliver the order with au jus already infused onto the sandwich which makes for a soggy mess. This was much more enjoyable. The potato salad had a distinct Mediterranean flavor. I'm not sure exactly what intensified this taste but whatever it was, it certainly made for a unique and scrumptious side dish. The garlic fries were delicious to say the least. Garlic roasted, crispy shoestring fries in a huge basket? You just can't get any better than that. It was truly a tasty afternoon treat and again, had I not been flying I would have had an order myself along with dessert. Next time I'll make sure to have lunch there again on the day I arrive rather than the day I leave. We had a great time there and we'll definitely be going back again. It is located on 6th and South Main street. It is very close to Pershing square and accessible public transportation. If you are in the Hollywood area, just take the Metro Red Line to Pershing square and walk a couple of blocks. It takes all of 15 minutes to get there. For more information visit Cole's Home of the French Dip. My father used to work in the beautiful art deco 'EASTERN' building when I was in high school. I can't believed we never went here when we visited him (which was often since he manufactured dresses!). I love french dip sandwiches! By coincidence there is a small restaurant that I routine called Cole's. Mine is just a small place, while the one in your picture is I'm sure much nicer. Beautiful picture, Jo! I'm hungry now.. This is how I've always known French dip supposed to be served--the Au Jus served separately. I haven't had this in a long time that, reading this post made me want to have this right now. Love your photo of the restaurant, by the way. The clear light reflections added depth and character to the finish product. Excellently work. beautiful picture of the interior of the restaurant too. Looks nice and cozy. I got hungry with your description of the sandwich and potato salad. lol. Margie: My sister, Edna, likes a French Dip. dawn, :D I get hungry every time I think of it. Kathleen, the building now is fantastic. It is extremely secure and safe. I went up on the roof as well and there is a gorgeous courtyard with dipping pool etc... Very nice lofts and living units. I was very impressed. tashabud, I like it seperate as well. Thanks so much for stopping by and leaving your comments. betchai, yes you should try it when in LA. It's well worth the trip. Liz, :) Sorry I made you hungry. Margie, well Edna has fantastic taste. He's my favorite "dip" as well and I'll being having a taste tomorrow evening around 10:00 pm. It sounds fabulous, Jo. There are some great eateries in L. A. In my friend, Jeannie's neighborhood, Los Feliz, there are so many really special restaurants within walking distance of her house. I'd really be in trouble if I lived there!